ELMHURST, NY -- A New York task force arrested two men, one from North Carolina, in Elmhurst, N.Y., on Tuesday evening and charged them with transporting about 100 pounds of heroin hidden within vehicle parts, the New York Police Department announced in a release Wednesday. The Drug Enforcement Administration estimated the drugs are worth at least $14 million. About 8 p.m. Tuesday, agents and officers observed a blue pickup and a silver pickup towing a hitch trailer and driving in tandem. Both vehicles had North Carolina license plates and were driving slowly. One vehicle was unregistered and both circled blocks several times. At 8:45 p.m., agents and officers approached the vehicles and identified themselves. A search dog alerted law officers to the presence of controlled substances in one of the pickups, and the two drivers, Peter Omar Garcia-Romero and Jose Guadencio Lantan-Vela were taken into custody. Garcia-Romero is a North Carolina resident. Lantan-Vela entered the United States on Jan. 15 using a travel visa. Both men are natives of Guatemala. The vehicles were taken to DEA's Manhattan headquarters where a search warrant was executed on both vehicles. Heroin was found concealed within a car axle casing that was in the bed of the silver pickup. 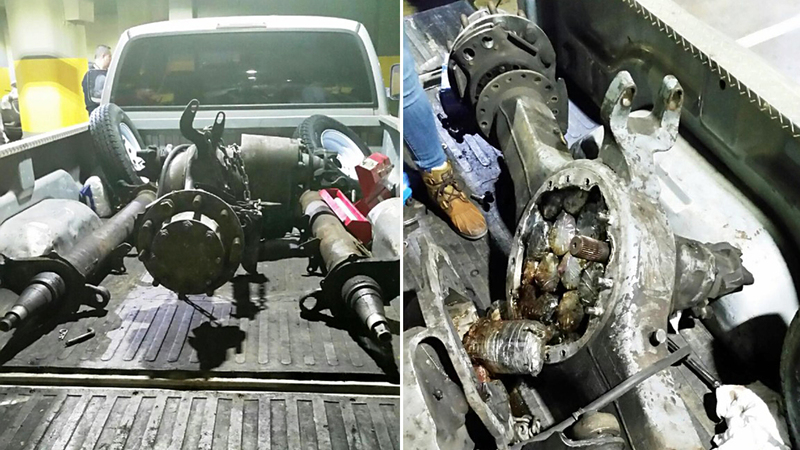 The axle was dissembled in three parts, and the heroin was found in the axle and the drive shaft casings. The heroin was pressed into round shapes to fit in the axle casing and packaged in square shapes to fit in the drive shaft. A team from the DEA's New York Drug Enforcement Task Force - comprised of DEA special agents, New York City Police Department detectives and New York State Police investigators conducted the surveillance that led to the arrests. Both defendants face one count each of conspiracy in the second degree, criminal possession of a controlled substance in the first degree, and criminal possession of a controlled substance in the third degree.